The Boyne Currach: From beneath the shadows of Newgrange , by Claidhgh (I understand it's pronounced "Clive") O' Gibne has received quite positive reviews. (Here's one, by Wade Tarzia.) I'm disappointed that I can't add to them. I find the book gravely flawed and seriously wanting. The Boyne is a river in County Meath, Ireland, running generally toward the east and entering the Irish Sea north of Dublin. 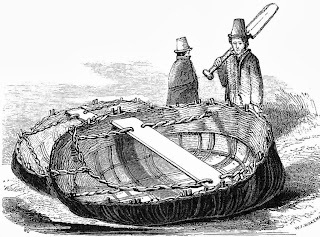 The river's common fishing boat was the currach, a small, nearly round leather-on-frame craft that in most of the British Isles is known as a coracle. (O' Gibne addresses the naming controversy.) The large landowners along the Boyne used to jealously guard their exclusive rights to fish the river, maintaining their own small fleets of currachs and hiring men to fish for salmon with seine nets. As O' Gibne tells it, in spite of privately-employed wardens and monitoring by the local police, poaching by private currach owners was widespread (but we'll make no puns -- none! -- about poached fish). The Boyne Currach describes this local history. It also delves into the history and mythology of skin-on-frame craft in general; the history and folkways of the Boyne Valley; the ancient history of the Celts and Ireland; and the history of modern currach preservation efforts. There's a chapter (just one) on how to build a Boyne currach; another about the Boyne Currach Centre, which O' Gibne founded and maintains to perpetuate the craft of the craft; and a section about the Newgrange Currach Project, referring to an entirely different form of currach (the more familiar boat-shaped type, somewhat similar to Tim Severin's Brendan) which O' Gibne had under construction at the time of the book's publication. This great variety of material is, in my opinion, one of the flaws of The Boyne Currach: it attempts too much in its 164 pages and loses coherence along the way. I would have liked more detail on the boatbuilding methods for both the types discussed. O' Gibne's description of the building process for the coracle-style currach is confusing and perfunctory (especially concerning leather tanning), and he merely glosses the construction of the larger boat-shaped vessel. 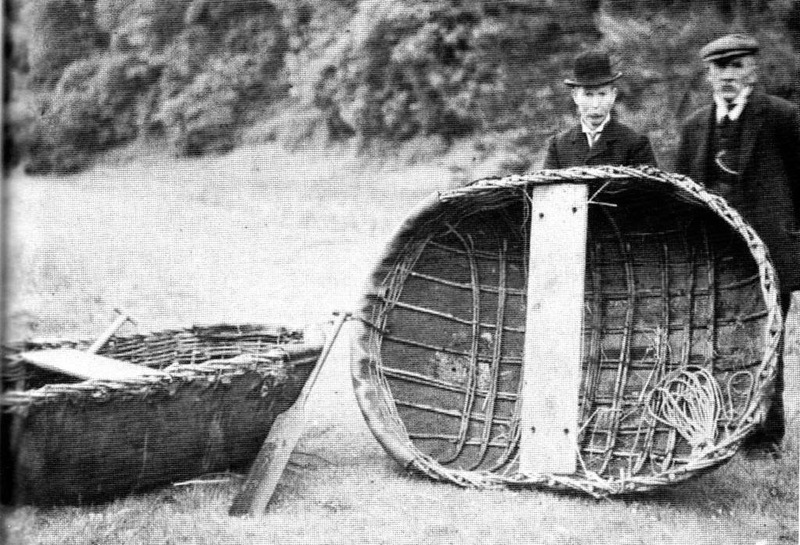 There are, however, enough excellent photographs and (perhaps) enough usable illustrations so that one could build a coracle-style currach by referring to them and perhaps gleaning sufficient tidbits from the text to supplement them. In this 1910 photo of a Boyne currach, the gentleman in the bowler hat is J.P. Holland, inventor of the first practical submarine. In addition to its historical photos and illustrations, The Boyne Currach contains sketches by O' Gibne. These, though, are often mere decorations, and even among those that attempt to be informative, many are full of distracting, nouveau-Celtic imagery and other New-Agey psychedelia and therefore lacking in clarity. Purportedly showing to how twist willow rods to make the rope that supports the seat in a currach. 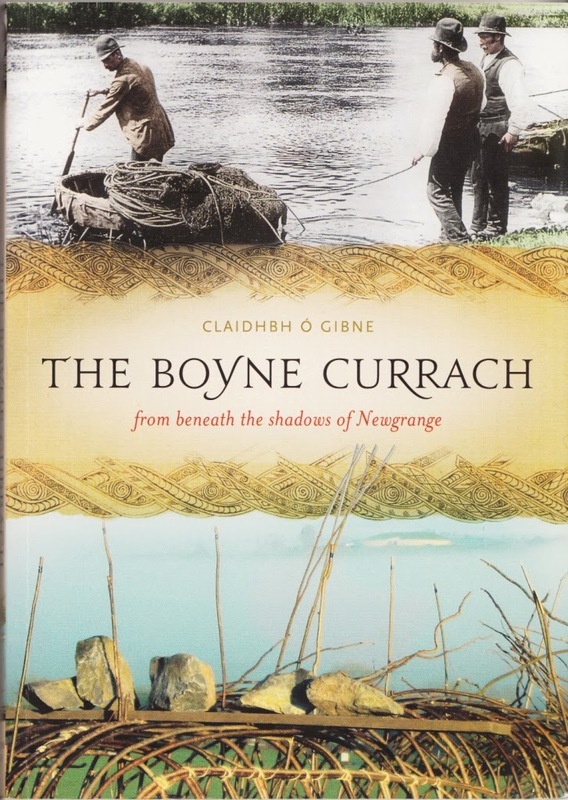 When it comes to the history of currach folk on the Boyne, O' Gibne is indiscriminate, mixing history and anecdotes about fishing and poaching with irrelevancies about milking cows and riding bicycles. These decades-old bits of gossip may be of interest to local residents who recognize their neighbors' great-grandparents in them, but they're of little value to readers who's primary interest is the boats themselves. Most significantly, The Boyne Currach needed an editor. The language is often idiomatic or just plain unclear, the organization disjointed, too many of the how-to explanations are sketchy, and the content frequently drifts off-topic. I find this inexcusable in a book that was peer-reviewed, as its publisher, Four Courts Press, claims all its books are. I understand that this is harsh, and I take no pleasure in slamming what was a sincere and worthy effort. O' Gibne's research concerning the historical use of the Boyne currach is worthwhile to historians and students of folkways. His dedication to learning traditional currach-building skills and perfecting his own is commendable, and the boats he builds are lovely in the way that simple tools and antique technologies can be. That he has taken his love for the currach and turned it into a vibrant cultural-and-boating organization (The Boyne Currach Centre) is admirable. Thanks to O' Gibne, there are now many boaters campaigning their home-built currachs on the Boyne and elsewhere, and that's just flat-out wonderful. The Boyne Currach is not entirely lacking in value. As noted, it contains much that will be of use to historians, and its historical photos and illustrations are quite revealing of the currach's construction and use. It is, however, difficult to read and lacking in the clarity and detail that could have made it much more useful to boatbuilders and boat history enthusiasts. NOTE: I know The Boyne Currach is well-liked by some of my readers. I welcome opposing viewpoints in the Comments. I've been informed by Amazon that my Amazon Associates account will be terminated after Sunday, October 6, along with the accounts of all other Amazon Associates in Maine. This is Amazon's response to a new Maine law which creates nexus for companies that engage in internet affiliate marketing relationships. In other words, the state of Maine will now require Amazon to collect sales tax if it has affiliates here, and Amazon's response was discontinue affiliate marketing in the state. This blog is an Amazon Associate, promoting products on Amazon through the Indigenous Boats Store and through occasional product-specific ads at the bottom on some posts (like this recent post about long voyages in folding kayaks). I'm not sure if Amazon plans to take down the Indigenous Boats Store altogether, or simply stop paying referral fees for sales that originate there. But in any case, this source of (very limited) supplemental income is about to disappear for me. If you had planned any purchases of books on canoes, kayaks, rafts, sampans, umiaks, coracles, or any other subject covered by this blog, please consider doing it through the Indigenous Boats Store before October 7. I will receive a small commission on your purchase, which will be priced the same price as if you went directly to Amazon. Orders and returns are also handled the same way. FYI: You can also access the Indigenous Boats Store via the advertising band that appears just below this blog's header when viewed in a standard browser. It does not appear in Blogger's mobile version. We're writing from the Amazon Associates Program to notify you that your Associates account will be closed and your Amazon Services LLC Associates Program Operating Agreement will be terminated effective October 6, 2013. This is a direct result of the unconstitutional Maine state tax collection legislation passed by the state legislature and signed by Governor LePage on June 5, 2013, with an effective date of October 9, 2013. As a result, we will no longer pay any advertising fees for customers referred to an Amazon Site after October 6, nor will we accept new applications for the Associates Program from Maine residents. UPDATE, 5 October, 2013: This post was updated to more accurately reflect Maine's new tax law. A previous statement here concerning a sales tax on affiliate advertising was incorrect. Thanks to Cate Monroe, CPA, for the clarification. AP photo. Click to enlarge. According to an AP article carried by Fox News (among others), a well-preserved dugout canoe was recently recovered from a lake near Ocala, Florida. The article includes little detail about the boat, other than its approximate length ("nearly" 20 feet), but it is generally factual, and it makes no assumptions, wild or otherwise, as in the case of a possibly-marine-related finding reported in Wales. In spite of the AP reporter's good efforts, however, the Fox headline writer felt compelled to juice the news, calling the find an "ancient" canoe when, in fact, its age is unknown. While "ancient" isn't an objective term, I think most would agree that it shouldn't be applied to archaeological finds in North America dating to the 19th century or later. Until carbon dating is completed, it's impossible to say whether the canoe at hand is any older than that. It could, in fact, be younger. From the photo, it looks to be in excellent condition. The caption to the AP photo refers to a "burn mark" on the inside of the boat, but doesn't indicate whether this was an artifact of the construction process. Burning was a common method used to hollow out a logboat, especially prior to the introduction of steel tools by Europeans into the Americas, but other explanations for the mark are possible. As I observed in the previous post about the finding in Wales, the general news media is often a poor source of science information. This is often due, I'm sure, to the lack of science training among general-news reporters, and to the tight deadlines they face which prevent them from carefully checking and clarifying facts and statements. In the present case, however, it was the headline writer who's at fault, trying to make more of a story than is really there. That this was Fox's doing can be easily demonstrated. Google the first sentence of the AP article, and you'll see the story reported verbatim by many news sources. Only Fox inserted the word "ancient" into the headline. A Catamaran with an Outrigger? Three closely-spaced channels were discovered dug into the ground near the site of a vanished lake in Monmouth. All are 30m long; two adjacent ones are 1m wide, and the third beside them is narrower. The channels appeared over a mound of charcoal that has been carbon-dated to the Bronze Age (2,500 to 800 BCE in Britain). According to Stephen Clarke of the Monmouth Archaeological Society, the find represents a kind of launching ramp for a Bronze boatbuilding facility. 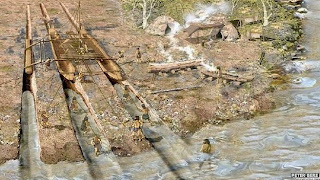 Although no boat remains or evidence of woodworking have been found at the site, artistic reconstructions show the site used to launch a canoe with twin dugout hulls and an outrigger. The use of monohull dugouts in Bronze Age Britain is well proven. There is no prior evidence for multi-hulls. If the site was indeed a boat launch, three alternatives offer more likely and practical interpretations: i. three monohulls (two wide, one narrow); ii. a twin-hulled canoe and a narrow monohull; or iii. an outrigger canoe and a wide monohull. There is also no evidence for the use of sails in Britain's Bronze Age, although a mast is shown in both reconstructions, and a sail in the line drawing. But even the notion that the site represents a boatbuilding facility, or any sort of boat-related facility, cannot be accepted so easily. Aside from the absence of woodworking or boat-related artifacts, the trenches make little sense for the purpose of boat launching. 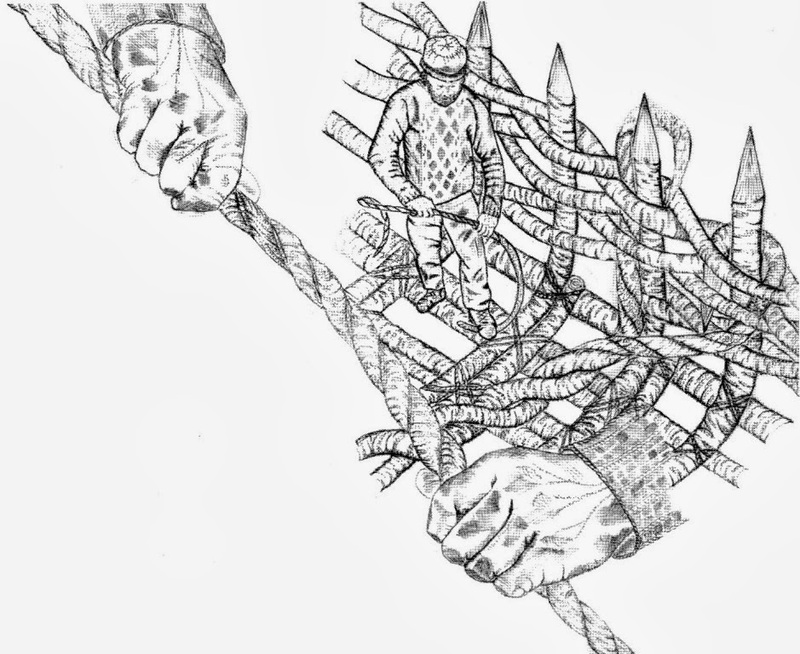 If one wanted to drag a heavy boat up and down the shore, the last thing he would do is carve channels that would increase friction around the hulls. 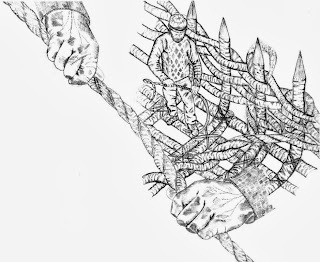 Friction would be much lower if the rounded hulls rested on a flat plane, and flat ground would also permit the use of rollers or, if the ground was too soft or sticky, launching ways similar to Hawaiian canoe ladders. Even if the trenches did make sense as a launch ramp, there is no reason for them to have been so long. Assuming that the color illustration is accurate in its depiction of the slope of the shore and the trenches' location relative to the water level, the trenches extend much farther than necessary to haul the boat(s) entirely out of the (non-tidal) lake. The amount of extra work that would have been required to dig the trenches, and to haul the boat any farther than just out of the water, makes its use as a boat launch unlikely. One final item: since the trenches were found above the charcoal, they must be of more recent origin. 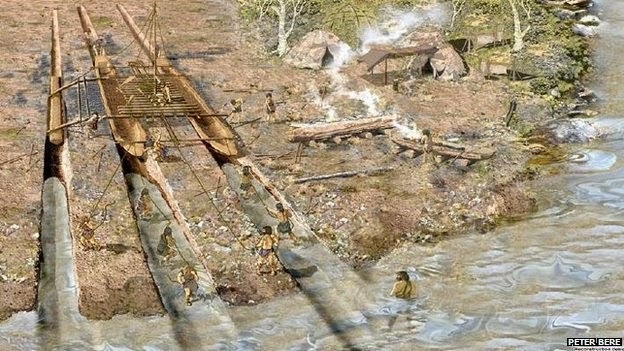 Britain's Bronze Age lasted for 1700 years or so, and the article doesn't report the exact carbon-dated age of the charcoal, but from the information available, it seems possible that the trenches were dug after the end of the Bronze Age. I have no better, alternate interpretation for the find, but the current one seems to be based on a poor understanding of boats and how they are used. The BBC article claims that Mr. Clarke has a book on the subject in the works: this promises to be a fanciful piece of pseudo-archaeology, akin, perhaps, to the laughable and inexplicably well-known The Life and Death of a Druid Prince . Update (2 Oct., 2013): This article by the Daily Mail contradicts some details of the BBC article, and provides useful photos of the excavated channels. It states that the channels were cut through the charcoal deposits (dated to the early Bronze age), not over them. And it reports possible evidence of woodworking at the site, in the form of "sharp flakes of imported flint found alongside the channels." The article claims that "Prehistoric cave drawings in Scandanavia (sic) have been discovered depicting outrigger boats like the one built at Monmouth," but provides no backup for this statement. 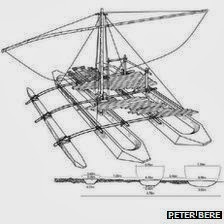 The images it shows of "similar" boats of the historic period depict double canoes and single-outrigger canoes, but no double canoes with outriggers.